With a 50,000 square foot shop and 20 ton lifting capacity, there is little that Johnson Hydraulics cannot accomplish. We offer many types of cylinders, primarily rotating, air, and hydraulic. If you need a copy of our catalogs, please feel free to fill out the form below and we wil be happy to send you any information you require. 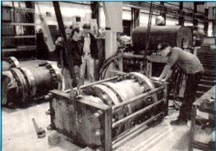 All cylinders are 100 percent tested before shipment. 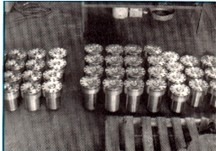 No quantity is to many for Johnson Hydraulics personel. No cylinder is too large for Johnson Hydraulics to handle. 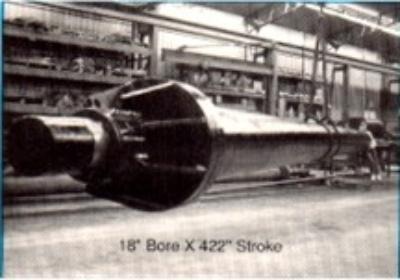 Pictured left is an 18" bore x 422" stroke cylinder.